Michael Cunningham, Francine Prose, Aimee Bender, Kelly Link, Jim Shepard, and more than thirty other extraordinary writers celebrate fairy tales in this thrilling new volume. Inspire by everything from Hans Christian Andersen’s “The Snow Queen” and “The Little Match Girl” to Charles Perrault’s “Bluebeard” and “Cinderella” to the Brothers Grimm’s “Hansel and Gretel” and “Rumpelstiltskin” to fairy tales by Goethe and Calvino and from China, Japan, Vietnam, Russia, Norway, and Mexico, here are stories that soar into boundless realms, filled with mischief and mystery and magic, and renewed by the lifeblood of invention. Although rooted in hundreds of years of tradition, they chart the imaginative frontiers of the twenty-first century as powerfully as they evoke our earliest encounters with literature. Fairytales are always an interesting creature. Written by adults, for children, they almost can’t help, but be a little dark. And these retellings especially so. I felt there was only one story in the entire collection that had a happy ending: “Psyche’s Dark Night” by Francesca Lia Block. I really enjoyed that story, but I would say it also probably had to do with the frame of mind I was in when I read it. I’ll be checking out some of her other work. Overall, I enjoyed these stories, though I found some decidedly creepy. Most of the authors were new to me, with the exception of Aimee Bender, Neil Gaiman, Sarah Shun-Lien Bynum, John Updike, Joyce Carol Oates, and Ilya Kaminsky. Aimee Bender’s story, “The Color-Master” was my absolute favorite. But then, I’m kind of an Aimee Bender fangirl. Sarah Bynum’s story made me feel all the feelings, in an uncomfortable way. I liked it, but I also found it unsettling. It was interesting to see Neil Gaiman try a new format in “Orange”, through just the answers in a fictional Q&A. 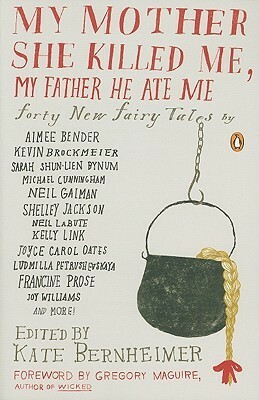 Another notable story for me was “The Mermaid in the Tree” by Timothy Schaffert. Very good, very beautiful story. He’s definitely an author I want to check out further. Other standouts were “Catskin” by Kelly Link and “A Day in the Life of Half of Rumplestiltskin” by Kevin Brockmeier. At the end of each story, there is a section of commentary by the author. This is often a discussion of the original story, the inspiration, and/or additional info on the retelling. I really loved having these included, though some of the authors definitely used it as a place to launch off on a pretentious slog of literary theory. Gregory Maguire’s introduction is definitely worth a read…also a fairytale unto itself. I would definitely recommend this to people interested in fairytales or for people who like some of the authors in the collection. There are over forty stories in here, so there’s a lot to go through. A very nice collection. This sounds like a fabulous book! I absolutely love re-tellings of old tales and fable. Can’t wait to read Michael Cunningham’s contribution to this collection. This is definitely a buy for me. I bought this book about a year ago and still haven’t read it all; I mostly bought it for Francesca’s story. I love everything she writes. I highly recommend her work if you like dark, magical, lyrical writing.